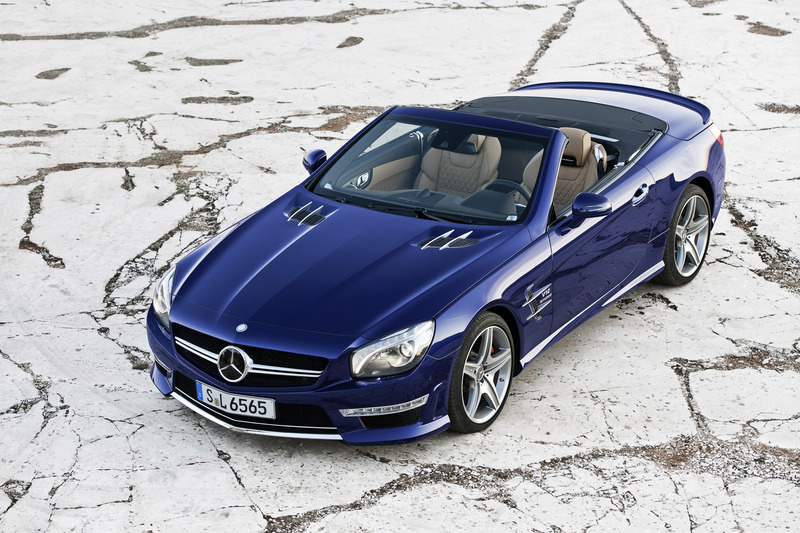 Mercedes-AMG is embarking on the 2012 roadster season in inimitably dynamic style: following on from the recent launch of the SL 63 AMG, the top eight-cylinder model, there now comes the presentation of the new Mercedes-Benz SL 65 AMG, the V12 roadster in the line-up from the Stuttgart-based manufacturer. The AMG 6.0-litre V12 "biturbo" (twin-turbocharged) engine develops a maximum output of 630 hp and maximum torque of 1000 newton metres. The result: exceptional performance, impressive power delivery and effortlessly superior dynamics. As with the SLS AMG super sports car, the use of an all-aluminium bodyshell results in a drastic reduction in weight. 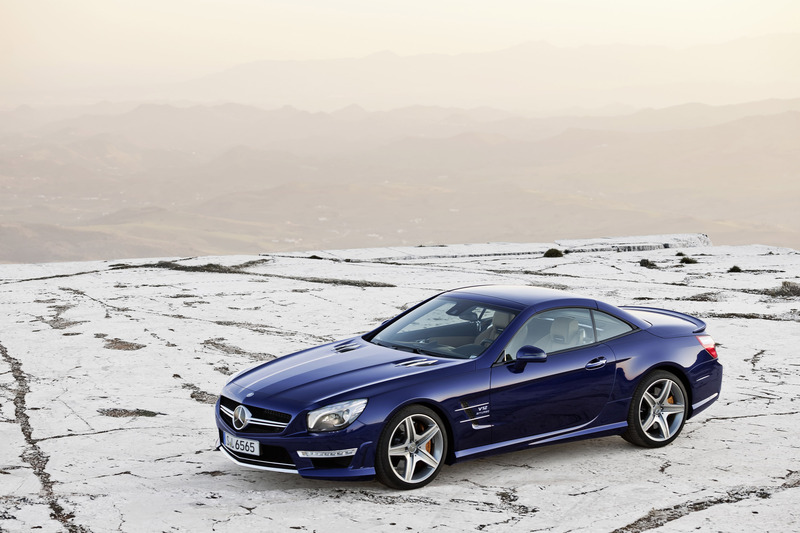 The new SL 65 AMG is some 170 kilograms lighter than before. The expressive front section is dominated by the new "twin blade" radiator grille and the front apron's lower cross strut in high-sheen chrome. "The combination of exclusive V12 dynamic performance and a refined roadster driving experience was already the defining attribute of the predecessor model. 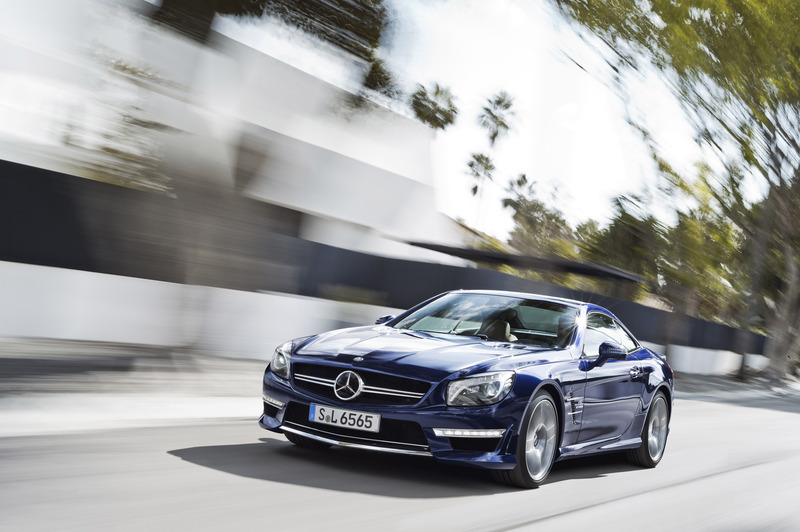 We are convinced that, with the new SL 65 AMG, we have developed an incomparably exciting high-performance vehicle for the small, but loyal community of fans," says Ola Källenius, CEO of Mercedes-AMG GmbH. An important aspect of the new model is the intelligent lightweight construction which also contributes to improved fuel efficiency. At 24.4 mpg (NEDC combined), the new car is 17 per cent more efficient than the previous SL 65 AMG and simultaneously establishes a new benchmark in the twelve-cylinder petrol engine segment. A major role in the reduced fuel consumption figures is played by the AMG SPEEDSHIFT PLUS 7G-TRONIC transmission, the ECO start/stop‑function, in-engine measures to optimise efficiency and alternator management. Despite the significantly reduced fuel consumption, the maximum output of the AMG V12 6-litre biturbo engine is up from 612 hp to 630 hp. The maximum torque is 1000 newton metres. The unrivalled performance figures of the new SL 65 AMG translate into an exceptional driving experience: acceleration from 0 to 62 mph takes 4 seconds with the 125 mph mark attained after just 11.8 seconds. The top speed is 155 mph (electronically limited). As well as offering stunning acceleration, the AMG twelve-cylinder biturbo engine impresses with its smooth running characteristics and its distinctive AMG V12 sound. It is a performance that reconciles effortless superiority and stylishness to perfection. The AMG 6-litre V12 biturbo engine with the designation M 279 is based on the M 275 engine used previously and has been comprehensively revised for the new SL 65 AMG. New exhaust gas turbochargers with an increased spiral cross-section, new manifolds and wastegate ducts with optimised flow characteristics increase the engine output by 18 hp. The multi-spark ignition with twelve double ignition coils not only results in smoother running, but also enables even more effective combustion in combination with a new engine management system with higher performance and optimised cylinder heads. The resulting reduction in exhaust emissions is also due to a large extent to the optimised catalytic converter system. The newly developed AMG sports exhaust system, which has a pipe layout with enhanced flow characteristics, is 3.2 kilograms lighter as a result of a reduction in the wall thickness. 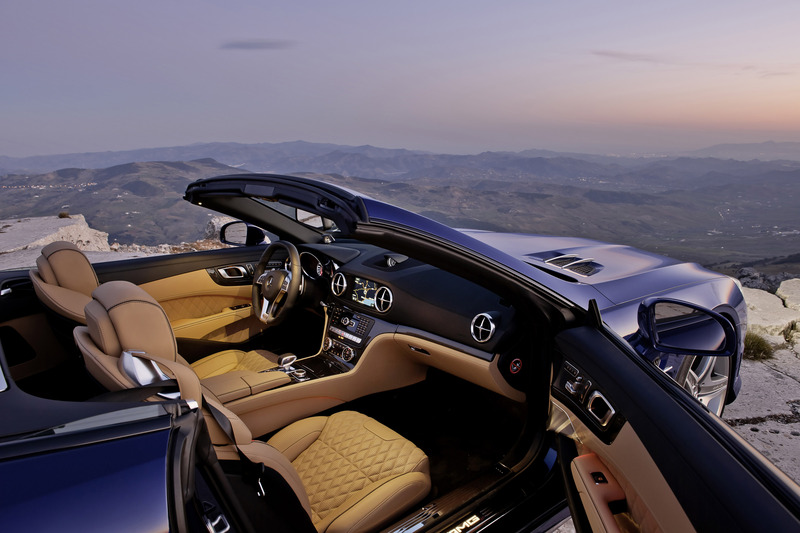 But it is not just the inner qualities of the AMG 6-litre V12 biturbo engine that impress. The powerplant's looks are as inspiring as its performance: the high-quality carbon-fibre and aluminium engine cover reflects the exceptional character of the powerful twelve-cylinder unit. 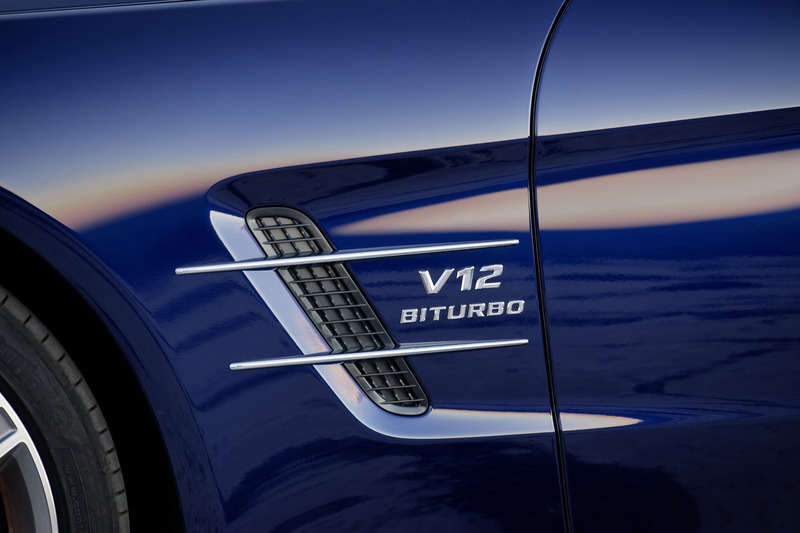 For the first time AMG has combined the 6-litre V12 biturbo engine with the AMG SPEEDSHIFT PLUS 7G‑TRONIC. The seven-speed automatic transmission with its wide gear ratio spread enables a significantly lower engine speed and helps to reduce fuel consumption. A new fuel economy torque converter, bearings designed for reduced friction loss and the transmission-oil thermal management system are responsible for a further increase in the efficiency of the power transmission system. 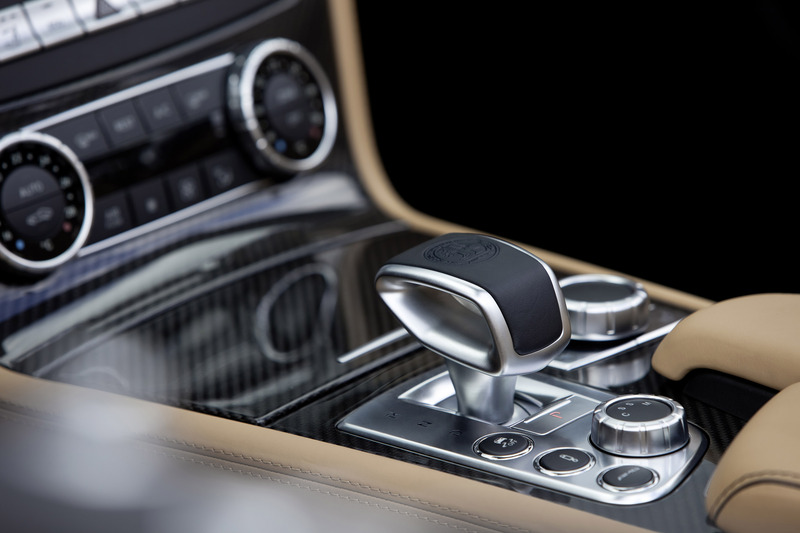 The AMG SPEEDSHIFT PLUS 7G‑TRONIC has four different driving modes – Controlled Efficiency (C), Sport (S), Sport plus (S+) and Manual (M) – which can be selected at the push of a button on the centre console. In "C" mode the ECO start/stop function is permanently active. The compelling, dynamic character of the driving experience is made all the more vivid by the automatic double-declutching function during downshifts and through the brief, precisely defined interruption of ignition and fuel injection during upshifts under full load; the latter functionality has the additional benefit of reducing the shift times. Compared with the predecessor model's steel design, the all-aluminium bodyshell of the new SL 65 AMG delivers a significant weight saving of around 110 kilograms as well as superior rigidity, safety and comfort. Intelligent lightweight construction also means that the components have been optimised in line with their specific purpose. Various types of processing are used for the aluminium components, for instance, which are produced as permanent mould castings or vacuum die castings before being processed into extruded sections or used in the form of sheet aluminium with varying wall thicknesses. The result is high rigidity, high safety and improved vibration characteristics. For the cover behind the tank, the designers use even lighter magnesium material in certain areas. High-strength steel tubes are integrated into the A-pillars for safety reasons. The boot lid helps to further trim the weight. For the first time on a volume-produced model, the inner support is made from lightweight carbon-fibre composite. 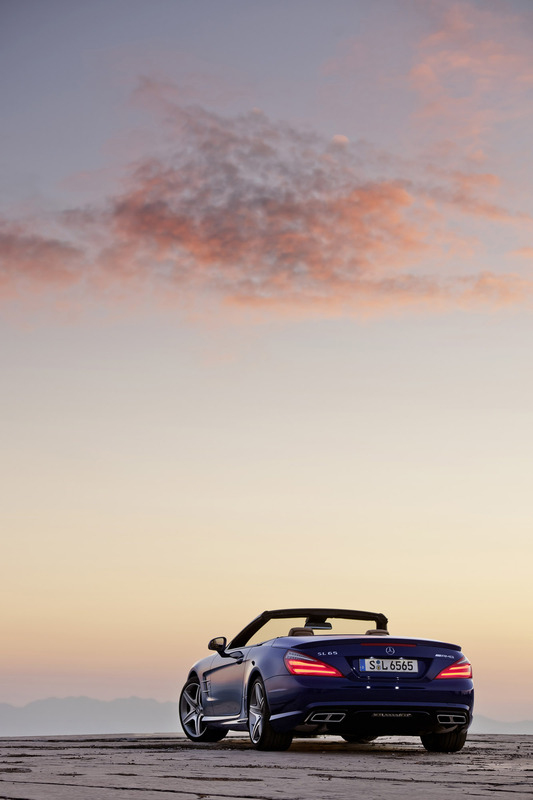 The extremely rigid carbon-fibre component is bonded to the plastic outer shell, resulting in a weight saving of five kilograms compared with a conventional boot lid – an innovative solution that is being pioneered with the AMG SL models. This raft of innovative lightweight-design measures means that, at an EC kerb weight of 1950 kilograms, the new SL 65 AMG is 170 kilograms lighter than the model it replaces. Mercedes-AMG also makes systematic use of lightweight construction principles for the suspension. The steering knuckles and spring links of the 4-link front suspension and almost all of the multi-link independent rear suspension components are made of aluminium. Both the vehicle's handling agility and the response of the spring and damper components are enhanced by the reduction in unsprung masses. 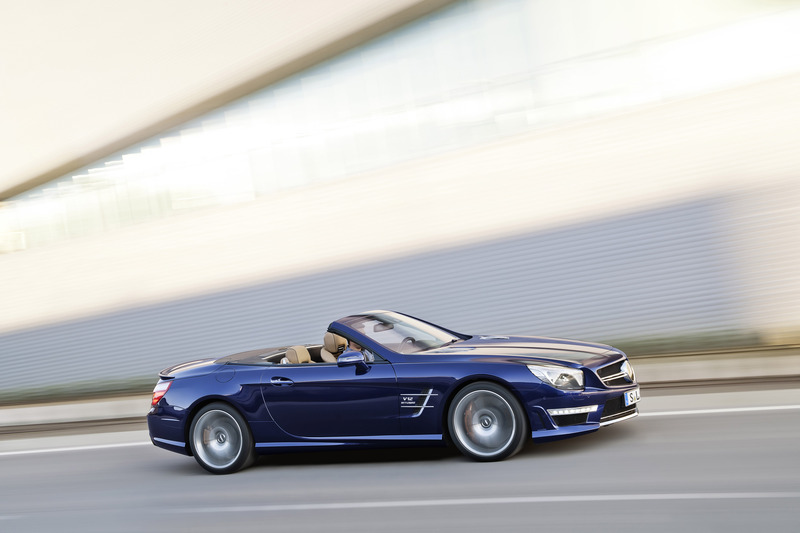 Like the predecessor model, the new SL 65 AMG is equipped as standard with the ABC active suspension system. The AMG sports suspension based on Active Body Control fitted in the eight-cylinder SL 63 AMG has been enhanced and its setup optimised for this new top-of-the-range model. Driving dynamics and performance were the key objectives during the design, development and testing phases. It is possible to choose between two suspension settings at the touch of a button: distinctly sporty characteristics with reduced roll angles and firm body damping ("Sport") or a mode for high comfort on long journeys ("Comfort"). More negative camber on both axles and fully revised elastokinematics result in greater agility and faster cornering speeds. Equipped with the newly developed electro-mechanical AMG speed-sensitive sports steering, the V12 top model impresses with high dynamic qualities and eloquent feedback at the critical limits. The steering has a constant, more direct ratio and variable power assistance which adjusts in line with the suspension mode. Further standard equipment includes 3-stage ESP®, a special feature exclusive to AMG with "SPORT Handling" mode for particularly keen drivers, and an AMG rear axle differential which helps ensure that the phenomenal engine output is put down on the road as effectively as possible. All the qualities expected of an AMG high-performance braking system – excellent deceleration characteristics, optimum sensitivity and high resistance to fading – are delivered to perfection by the newly developed brake system of the SL 65 AMG. It features 390 x 36 mm compound discs with six-piston fixed callipers at the front and 360 x 26 mm integral discs with single-piston sliding callipers at the rear. An electric parking brake is fitted as standard. Red-painted callipers, as well as the even more powerful weight-optimised AMG ceramic high-performance compound brake system as seen on the SLS AMG, are available from the AMG Performance Studio as options. 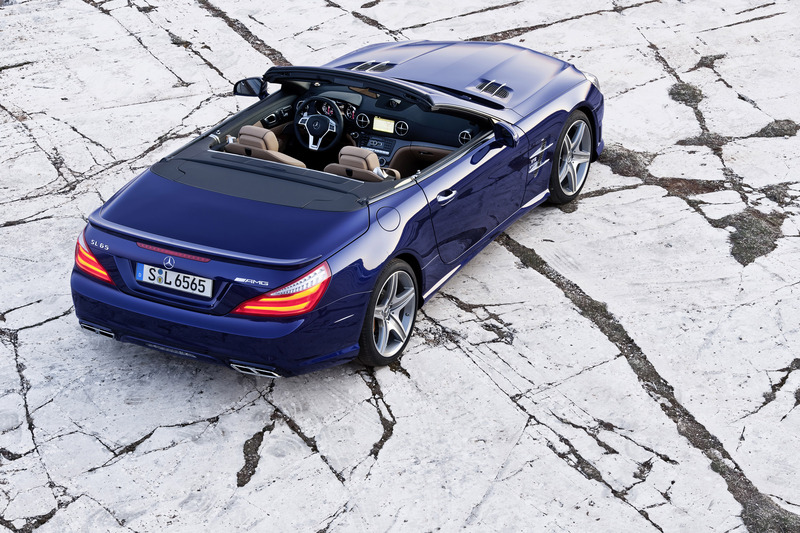 The new SL 65 AMG lives up to its stylish and exclusive high-performance roadster claim not only with its engineering but through its looks, too. 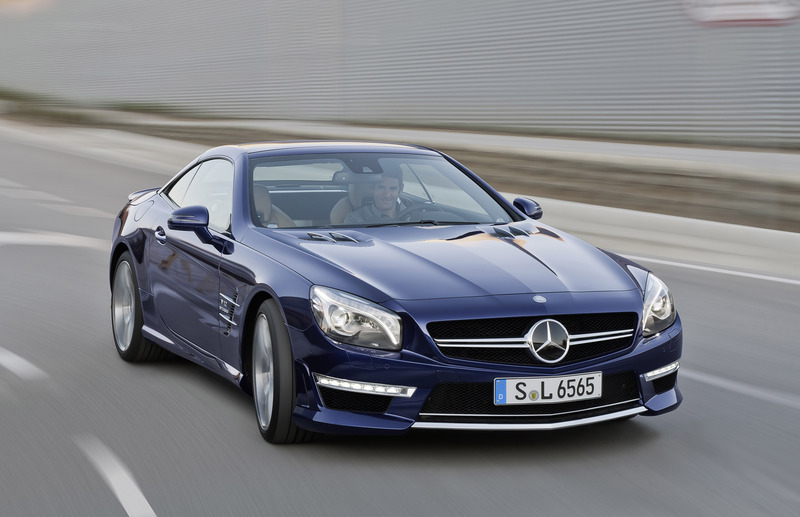 The SL 65 AMG is the first model to feature the new AMG brand face. The two elements which dominate the form – the radiator grille and the lower cooling air intake – are retained but in reinterpreted form which gives them a more distinctive identity in terms of dynamism and the sense of perceived value they convey. The central styling feature is the new "twin blade" radiator grille in high-sheen chrome. The Mercedes star is mounted on two blade-like louvres whose profile recalls that of an aircraft wing. The more pronounced V-shape of the radiator grille optimises the longitudinal proportions of the vehicle and so adds even greater visual emphasis to the attributes of aerodynamics and purism. Below the "twin blade" radiator grille, the stylised "A", a characteristic feature of AMG vehicles, is retained. A gap formed below a fine black fin at the lower edge of the cooling air opening allows an optimum airflow over the cooling modules – a perfect combination of aesthetics and high technology. The lower cross strut in the front apron is finished in high-sheen chrome and is given a perceived sense of depth by the gap above it – a distinctive note which adds the perfect finishing touch to the front of the vehicle. The "twin blade" radiator grille and lower cross strut are the two complementary styling elements which underline the new AMG brand face – a look which will be picked up by the styling of future AMG models and so further increase the recognition value of the AMG performance brand. SL 65 AMG include the front apron with large openings for the engine oil, water, charge air and transmission oil coolers, the specially shaped side sill panels, the AMG spoiler lip and the diffuser-look rear apron with a vehicle-colour insert. In addition to the two special chromed twin tailpipes of the AMG sports exhaust system, the characteristic V12 features include the "V12 BITURBO" legend on the front wings and the AMG 5-spoke light-alloy wheels painted in titanium grey with a high-sheen finish and equipped with 255/35 R 19 and 285/30 R 19 tyres at front and rear respectively. AMG multi-spoke forged light-alloy wheels from the AMG Performance Studio with 255/35 R 19 front tyres and 285/30 R 20 rear tyres reduce the unsprung masses. The forged wheels are also available in matt black with a high-sheen rim flange. The sixth-generation SL retains the electrohydraulically operated vario-roof which can be retracted to save space, enabling the SL 65 AMG to be transformed into a roadster or a coupé, as the mood takes the driver and depending on the weather, in under 20 seconds. In contrast to the predecessor model, there are two versions to choose from for the new SL: the panoramic vario-roof or the unique panoramic vario-roof with MAGIC SKY CONTROL. The transparency of the latter can be switched to light or dark at the push of a button. Inside, too, the SL 65 AMG has exclusive design and equipment features which differentiate it from its eight-cylinder sister model. The electrically adjustable AMG sports seats with single or two-tone upholstery in Exclusive nappa leather with a special AMG diamond pattern are a particular highlight. This distinctive upholstery is also to be found on the door centre panels. 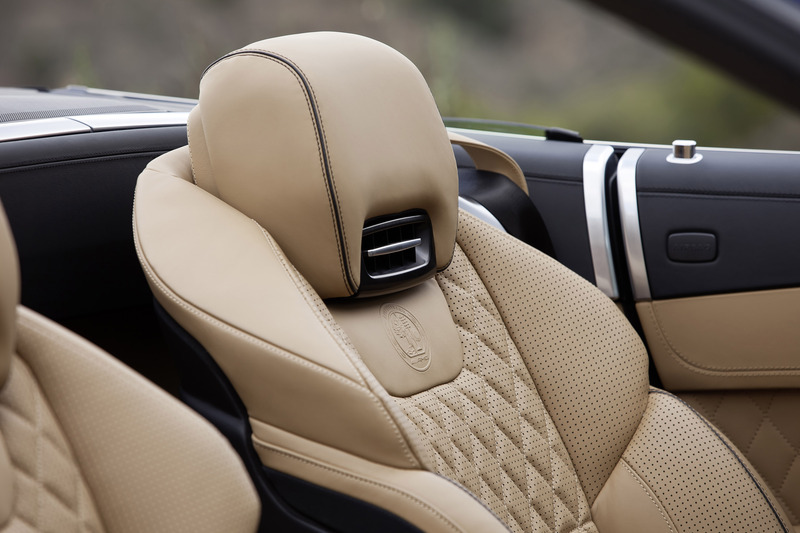 Embossed AMG emblems on the seat backrests are standard, as are AIRSCARF neck-level heating, multicontour functionality, seat memory and climatised seats. The designo headlining in leather with partial AMG V12 diamond-design quilting provides the perfect visual and tactile finishing touch. The design of the cockpit recalls the SLS AMG: the four air vents styled like jet engines, the E-SELECT lever and the AMG DRIVE UNIT are all reminiscent of the super sports car's styling. The choice of exquisite materials and the first-class workmanship which characterise the interior of the SL 65 AMG indulge all the senses. Highlights include the AMG carbon-fibre trim elements, the IWC-design analogue clock, the chromed AMG door sill panels illuminated in white and the AMG Performance steering wheel which is embellished by an AMG logo in the lower metal insert. A speedometer calibrated to 360 km/h in the AMG instrument cluster and the AMG start-up display with an exclusive AMG V12 BITURBO animation hint at the exceptionally dynamic performance of the SL 65 AMG. The designo range for the SL 65 AMG, available ex factory, offers a wealth of tailor-made individualisation options to cater for practically any requirement. As well as being able to choose between designo magno cashmere white and designo magno alanite grey matt paintwork or designo mocha black and designo graphite metallic paintwork, customers can also opt for an expressive designo zircon red paint finish. There is a range of Exclusive designo leather appointments in eight attractive colours to match these paint finishes. All rounded off perfectly by a choice of designo trim, headlining and seat-belt options. 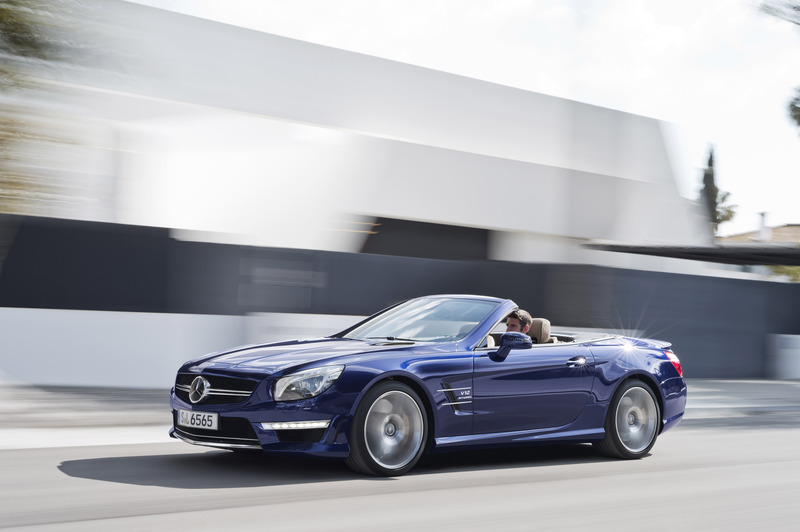 A crash-optimised aluminium structure, standard-fit PRE-SAFE® system and assistance systems on a par with those of the S-Class make the SL one of the world's safest roadsters. The rigid aluminium bodyshell forms a robust occupant compartment as well as precisely defined deformation zones at the front and rear. If the vehicle rolls over, A-pillars made from a steel-aluminium material mix and two automatic roll-over bars help to protect the occupants. The restraint systems, including two-stage driver and passenger airbags, have been further enhanced. A headbag covers much of the side head-impact area. An additional thorax airbag in the backrest can protect the upper body in the event of a side impact. 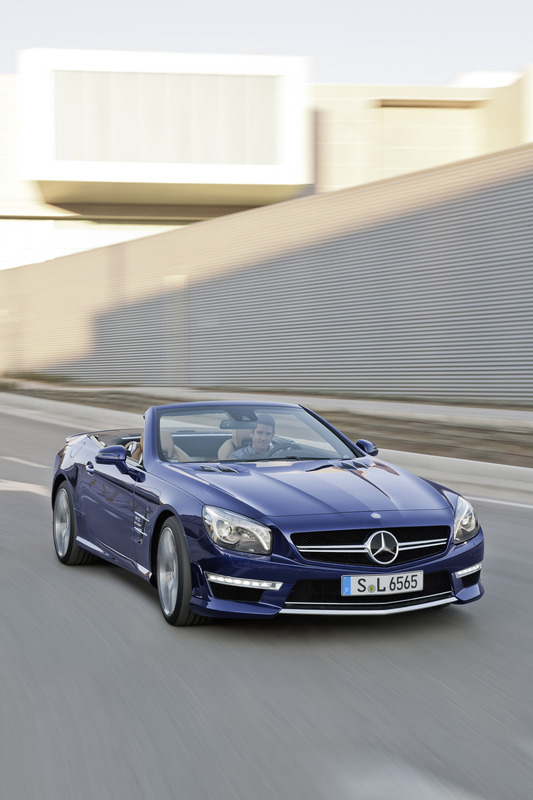 Further new standard features for the SL include the Mercedes-Benz-developed NECK-PRO crash-responsive head restraints. An active bonnet and a front end with a large, yielding impact area help ensure pedestrian protection.